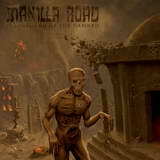 Let’s add another entry to the list of things automatic: death, taxes and the fact that Manilla Road is an unkillable band which will continue releasing albums with regularity. Shadow Kingdom Records was happy to issue a pair of re-releases by these Kansas icons, but the label must be beyond stoked to now unveil a new full-length release. As long as Manilla Road history has been, and as much material as Mark Shelton has created, the old bags still contain plenty of gunpowder and Playground of the Damned finds the band in fine form. The drums sound like shooting bullets and the bass is alternately snappy and warm, but there is no secret Manilla Road has always been about the riffs Mark Shelton would think of next. For Playground of the Damned it is the darker doomier territory which is explored. From the tighter flowy opener (Jackhammer) the focus shifts to droning, arduous laboring in Into the Maelstrom. Abbatoir de la Mort opens with practically a Candlemass moment and, fittingly, almost growls, whereas Fire of Asshurbanipal is another elephantine, heavy song, appropriately with the mid-Eastern feel, since Asshurbanipal was an Assyrian king. Such ancient mid-Eastern topic is common and revisited in various places throughout the album (Into the Maelstrom) with some cuts being downright convoluted, dark and progressive (title track). The epic material is not entirely abandoned, Quorthon and Grand Magus would have been proud about the heavy verse and sing-along chorus of Brethren of the Hammer. Whatever the scenery, Manilla Road always paints it in the most picturesque way. The clean beginning of Grindhouse shifting to a creepy walk fits the lyrics about the madman perfectly, as the song is in itself bipolar. Mark Shelton has always been a master of the hook, and he grows them here in abundance, the one in Abbatoir de la Mort after a clean acoustic interlude being the most penetrating. His leads are long, but masterful, true song apogee in Abbatoir de la Mort and Into the Maelstrom. The vocals always have been the only aspect of Manilla Road which took time for me to fully sink. Playground of the Damned is no exception, Bryan Patrick has not magically acquired an ability to soar where it would have been appropriate (Jackhammer) and Mark Shelton is still a bit nasal, if I understand correctly how their vocal roles are separated. Still, the delivery in the closing ballad Art of War is very fitting, spoken from the depth of experience by a life-battered man. If you like your Manilla Road a little more complex, a little more brooding and moody, where riffs tend to be denser and track closer to the bottom, you will learn to appreciate Playground of the Damned very quickly. At the very minimum, it is a fine traditional metal album with a doom slant delivered by a group of stalwart veterans demanding your utmost respect.